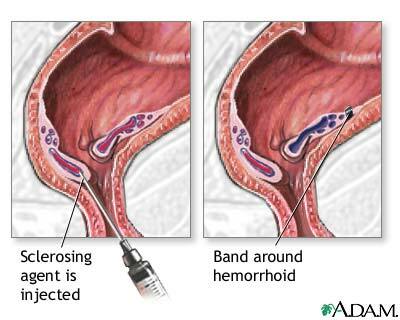 The hemorrhoid is ligated at its base, to prevent bleeding from the blood vessels within the hemorrhoid, then it is removed surgically. Alternatively, some surgeons will simply apply a rubber band around the base of the hemorrhoid (banding); deprived of its blood supply, the hemorrhoid will then simply fall off and be passed in the stool. Finally, some surgeons will inject the base of the hemorrhoid with a sclerosing agent (sclerotherapy), which also destroys the vessels in the hemorrhoid, causing it to fall off and be passed in the stool.